Pobalscoil Teachers Mr Denis O’Connor, Ms Deirdre Prendergast and Ms Anne Loughnane who recently graduated in the Instructional Leadership in Education Programme pictured with the course leader, Professor Barrie Bennett, University of Ontario. Second level education in Ireland is currently undergoing transition from the traditional Junior and Leaving Certificate programme to the new Junior Cycle, soon to be followed by a new Senior Cycle. This requires a comprehensive change in teaching methodologies. 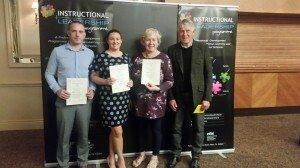 Three teachers from Kenmare Community School recently graduated in the Instructional Leadership in Education Programme. This programme focuses on instructional practices and their effects on student learning. It consists of six residential seminars held over three years in the Mount Wollesley Hotel, Tullow, Co Carlow. Professor Barrie Bennett leads the Instructional Leadership Programme. He is a renowned educationalist who taught for many years at the University of Toronto, Canada, and his interest in educational change has brought him to many countries. Professor Bennett has already led systemic change in education in Australia.